I've mentioned that I direct a Christmas outreach program called One Night in Bethlehem, where we turn our church into a Bethlehem marketplace and let people roam through, taking part in the interactive displays and crafts. Then we perform a play based on the first Christmas. That's coming up this weekend and it is an incredible amount of work, but very satisfying to see it all put together. I have an amazing team who each use their gifts to organize one or more aspects of the evening and I really wanted to thank them, so I designed a card which I will make enough of to give to the team. 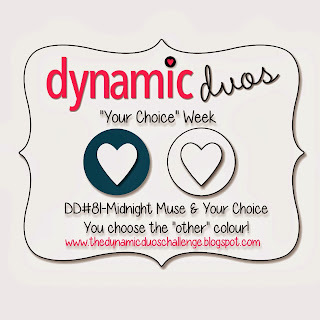 This is also created for the Challenge #81 over at Dynamic Duos this week. 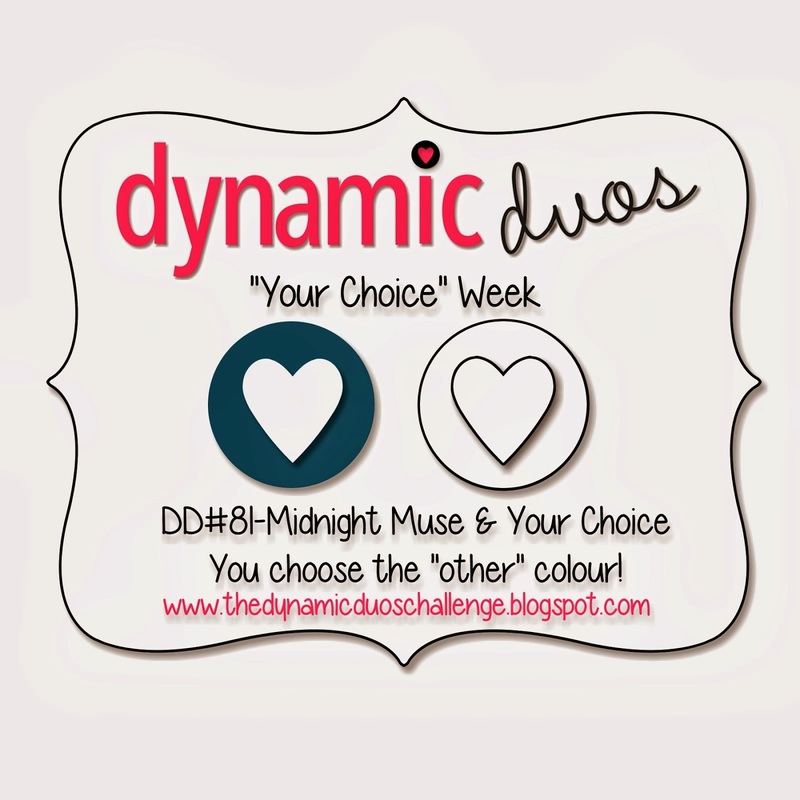 It's Your Choice week, so we are to work with Midnight Muse and one other colour of our choice. I chose silver for the festive sparkle. I used the elegant Dove from Calm Christmas and heat embossed it in Silver Stampin' Emboss powder. I wasn't sure how that would work with all those fine lines in the stamp. I thought they might be obliterated with the embossing powder, but as you can see, it worked brilliantly. I added a panel of Midnight Muse on the card base, but embossed it up to the ribbon with the Modern Mosaic Embossing Folder for a little texture on the bottom. This view gives a little better look at the sparkle and shine from the silver embossing powder (which is on the sentiment from Lacy and Lovely, too) and the Silver Glimmer paper. The Midnight Muse Stitched Satin Ribbon is beautiful layered on the Silver Glimmer paper. I added some Rhinestone Basic Jewels on the dove for a little added dimension and shine. The sentiment is also heat embossed and punched out with the Large Oval punch and layered with Glimmer paper punched with the Scallop Oval punch. I hope this helps my committee to feel my appreciation for them and all the work they did. I'll let you know how it went after this weekend. Thanks for dropping by! Totally going to CASE this card for my class Tuesday night! Thanks for the inspiration!